Consumer Reports has done the research for all of us! Here’s what made the list of top sunscreens. 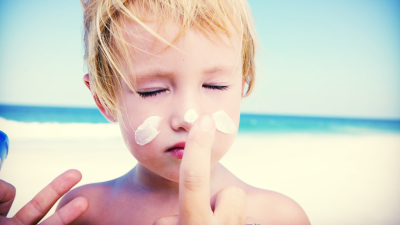 You want to protect your kids – and yourself – from the sun’s damaging rays, but how do you know which sunscreen is best? There are over a thousand varieties on the market! You have so many questions! Is spray or lotion better? What spf do you need? Do the more expensive options work better? Does name brand protect better than generic? Are the chemicals harmful for your children? Do the natural varieties really provide protection? Fortunately, Consumer Reports has done the research for all of us! Here’s what made the list of top sunscreens. How were the top sunscreens determined? According to Trisha Calvo, Consumer Reports deputy editor of health and food, each sunscreen was tested by applying it to the back of the test subject and then having them soak in water. They were submerged in water for the amount of time listed between applications on the label. The subjects were then exposed to UVB light from a sun simulator. The products were then analyzed for effectiveness based on their claims. If using spray sunscreen the safety experts at Consumer Reports recommend spraying it on your hands first and then applying to your little ones. The safety of breathing in the sunscreen is still being researched and kids are squirmy and more likely to inhale it than adults. As you can see, the top sunscreens on the list are of a variety of price points. Most expensive isn’t always best. A store brand even made the best sunscreen list! Keep your family protected from the sun while playing at the beach, gardening, swimming, camping or vacationing this summer. Let us know your favorite sunscreens in the comment section below!